Reactions of heavy metals with soil are important in determining metal fates in the environment. Sorption characteristics of two heavy metals, Cd and Pb, in three tropical soils (Mollisol, Oxisol, and Ultisol) from Puerto Rico were assessed at varying metal concentrations (0 to 1.2 mM) and pH values (approximately 2 to 7). All soils sorbed more Pb than Cd. 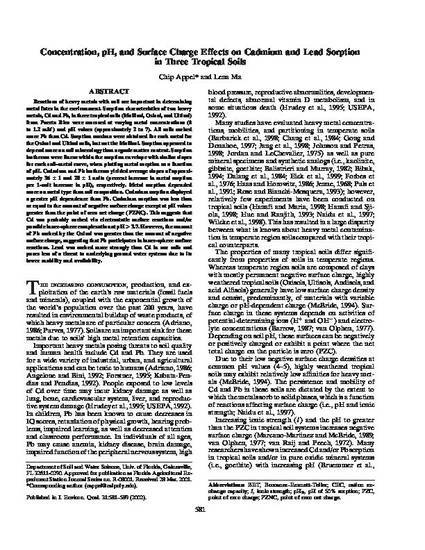 Sorption maxima were obtained for each metal for the Oxisol and Ultisol soils, but not the Mollisol. Sorption appeared to depend more on soil mineralogy than organic matter content. Sorption isotherms were linear within the sorption envelope with similar slopes for each soil-metal curve, when plotting metal sorption as a function of pH. Cadmium and Pb isotherms yielded average slopes of approximately 36+/-1 and 28+/-1 units (percent increase in metal sorption per 1-unit increase in pH), respectively. Metal sorption depended more on metal type than soil composition. Cadmium sorption displayed a greater pH dependence than Pb. Cadmium sorption was less than or equal to the amount of negative surface charge except at pH values greater than the point of zero net charge (PZNC). This suggests that Cd was probably sorbed via electrostatic surface reactions and/or possible inner-sphere complexation at pH > 3.7. However, the amount of Pb sorbed by the Oxisol was greater than the amount of negative surface charge, suggesting that Pb participates in inner-sphere surface reactions. Lead was sorbed more strongly than Cd in our soils and poses less of a threat to underlying ground water systems due to its lower mobility and availability.